As a FoodBuzz featured publisher, I was fortunate in receiving a package of Buitoni Riserva Wild Mushroom Agnolotti to try. I held off for a while because I wasn't sure what I wanted to do with it. After seeing other foodies post fabulous recipes using the pasta, it only made me ponder what I wanted to do with it even further. Well, it is a beautiful Sunday morning and I "need" to make some soup and I want it to be somewhat light (not as in calories...as in not heavy) and I want to use my pasta, so I decided to combine all of my efforts into one tasty bowl. Agnolotti is a sort of ravioli. This one in particular is large, half moon shaped with scalloped edges wrapped around an ABSOLUTELY, AMAZINGLY DELICIOUS mixture of fresh portobello & crimini mushrooms, Grana Padano & Parmesan cheeses and fresh roasted garlic; and the Buitoni Riserva pasta line is All Natural (minimally processed with no artificial ingredients). I decided to float some in a hot bowl of broth made chock-full of garlic, herbs and mushrooms. Garlic, Mushroom and Herb broth w/ Wild Mushroom Agnolotti by girlichef serves: ~4 Parsley Sprigs, small bunch Thyme Sprigs, small bunch Bay Leaves, small sprig (3 or 4) Garlic, 1 head, peeled Dried Shiitake Mushrooms, 3 ea. 6 c. Vegetable Stock, Broth or Water 1 pkg. (9 oz) Buitoni Riserva Wild Mushroom Agnolotti Combine all ingredients except Agnolotti in medium pot. Bring to a boil. Reduce heat to a simmer and allow to cook for about 20 minutes. Strain the broth. You could keep the whole garlic cloves (now soft) and the shiitake (sliced really thin) and add them back to the broth for serving. Cook the pasta according to package directions, until just al dente. Drain and add a few Agnolotti to each bowl. Ladle in some of the hot, strained broth. Garnish with some chopped, fresh herbs. I didn't have any set expectations for this pasta, but still I was pleasantly surprised! It was so packed full of gorgeous, earthy, salty, cheesy flavor. It is a good thing that my daughter and I were the only ones around to eat bowls of this beautiful broth, because I ate the remaining Agnolotti straight from the strainer. Honestly, it was that good...that addicting. So, big thanks to FoodBuzz and Buitoni for the opportunity to try this great, new pasta! I'm off to send this over to Deb at Kahakai Kitchen for Souper Sundays (go check it out...for this beautiful weather you can also send salads & sammies to go along w/ your soup...or on their own). 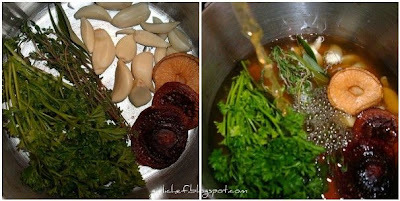 I love that you jazzed up your broth with the herbs, garlic and mushrooms! My mother and her husband go wild mushroom picking as a sort of part time business/hobby. I have gotten some really great varieties of mushroom from them! Mmm! I seem to be the only FB featured publisher who didn't receive any of this stuff! Well, that might be because I didn't sign up for the program! Ah well. The soup looks great! 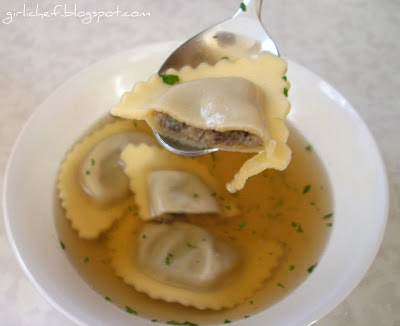 I frequently put tortellini in soup and it's fantastic. I absolutely love the simplicity of this. I know that each flavor would have an opportunity to shine through and not be masked. Well done! Great job, Heather! 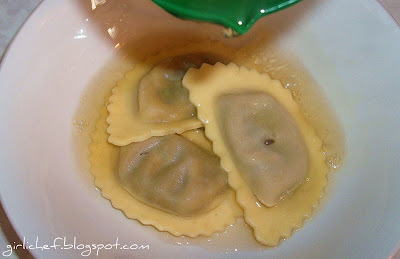 Your simple recipe really let the ravioli flavors shine. I got some of those, but not being a big fan of mushrooms I've passed them on to my sister in law, who loves them. Hopefully she will try them soon and write up a guest post for me. Glad you enjoyed them, it's a great application. OMG, absolutely mouth watering. Just reading the title is already make my stomach rumble. This is a standout from the crowd recipe. You managed to create something unique and put your name on it. Love your soup, great use of that product. Must be outstanding! You are amazing! I wish I thought of that! I am posting mine next week with a sauce but your way is so much more cerative--great job! Thanks for sending it to SS. Just got the round-up posted. This is calling my name. Broth and pasta and jazz it up? Does life get better than that? Really great posting. Definitely will do this! That looks so good! I would be eating them out of the collander too. How cool that you did a soup because no one else did! I received these as well and just ate them tossed with olive oil, s/p, and a dash of Asiago and red pepper. They were delicious. Best sample from FoodBuzz so far I think! Your so clever to make a soup with them. The broth rocks! Such outstanding flavors! Well done on the soup. Simple and, of course, looks delicious. I want to try that buitoni agnolotti. Everyone seems to love it. Great use of that pasta - it was absolutely a tasty surprise for any of us lucky Foodbuzz Publishers! Can you believe I never tried agnolotti, and I live in Italy? Mostly because they are normally with meat (veal and pork), and both me and my husband prefer pasta (ravioli, tortelloni etc.) with vegetables and cheese. The soup idea is absolutely great. Heather your blog is so mouthwatering. Man I'm hungry now and you live half way around the world! Drooooooool! I'm coming over next time I'm in the states! Thank you for your directions to Souper Sunday! I saw yours on there and thought it was a wonderful idea. How tasty! That broth is UNBELIEVABLE!! Very very very very creative and delicious!! I love mushrooms and I love this recipe!! Thank you for sharing and have a wonderful week. Looks great! I ate mine the other day, I served them with a fresh tomato sauce. yum. what a beautiful looking soup. That looks so good!! 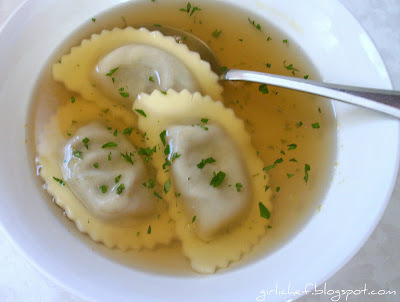 I LOVE brothy soups like that and I'll have to look for those Agnolotti... they look delish! So many people put soup on the back burner when the weather gets warm. I, for some reason, find it quite refreshing. I'll be saving this simply recipe idea for a Souper Day! Never thought to season my broth this way. Great idea!